In reading about a story of a selfless man adverting a major pileup on the Golden Gate bridge last night by using his Truck to gently force the stopped unconscious motorist ahead of him out of on coming traffic, (thank God) I've come across a cool sub story of this cool machine called the Zipper. If you've ever driven across a bridge that has changing lanes during peak rush hour times you agree with me that it can be dangerously surprising if its your first time and you find your self in on coming traffic if your not paying attention. What the world needs is a movable wall between these lanes of traffic. 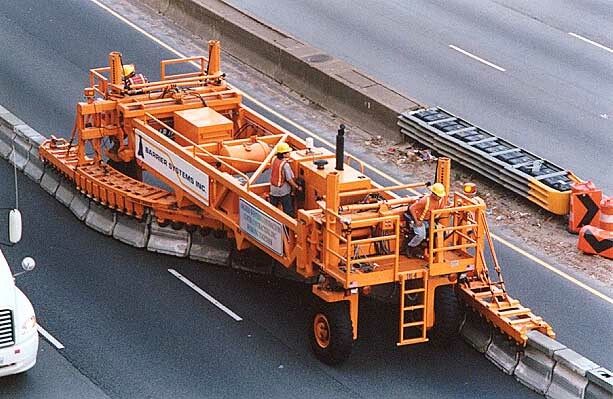 The "Zipper Machine" is rather impressive; it's a huge truck-like device that lifts the movable concrete median barrier about 6 inches off of the roadway, shifts it over, and then places it back down onto the roadway. The barrier is comprised of segments about 5 feet long, with strong interlocking steel brackets that hold the segments of the barrier together, so that it can "flow" through the Zipper Machine as well as have linear connectivity if a motor vehicle collides with it. 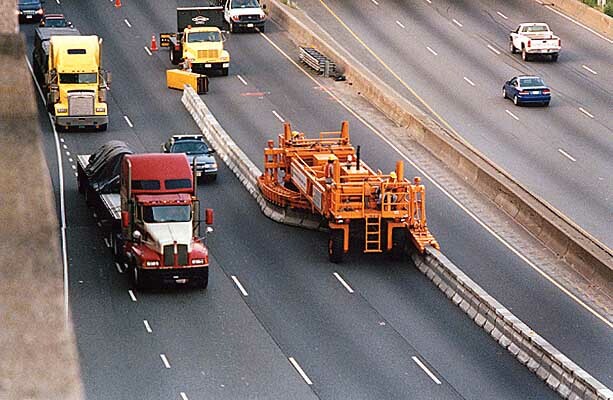 Jersey-type median barriers weigh 500 pounds per linear foot or more, so it takes a large powerful machine to perform this task, and it moves at 3 to 4 miles per hour. There is over a mile of movable barrier on the project, and it took about 20 minutes to move the entire barrier. Actually it takes two passes to do this, twice moving the barrier over by one lane; in other words, the barrier needs to be moved two lanes in all at the daily start of work, and then back two lanes at the daily end of work. The movable barrier is "parked" right next to the permanent highway median barrier when the bridge has its full 6 lanes open to traffic. It's all visible in the photo if one looks closely. Each barrier segment has a two-sided flange at the top, and the "zipper channel" has two tracks of closely-spaced small wheels that the flanges roll over. While it moves slowly, it will move a mile of barrier in 20 minutes, which would take a crew of four all day to move and expose all of them to the traffic while placing the barriers. 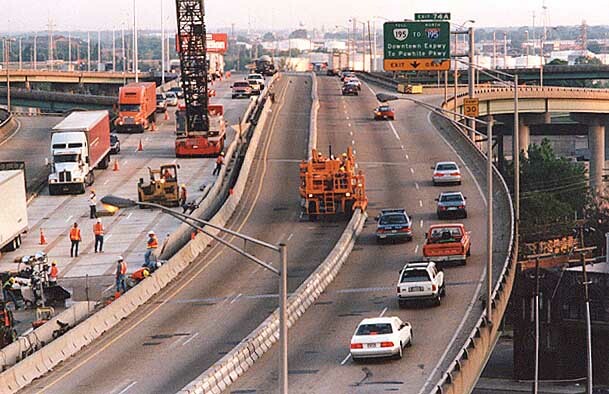 That would involve a small truck crane to lift and replace the barrier segments one at a time, and a means to detach and reattach the interlocking steel brackets that hold the segments of the barrier together. The Zipper Machine does it far more efficiently. Both front and rear wheel trucks are steerable, and you can see a steering wheel and steering crewman at each end of the machine. The Zipper Machine is actually a quite large vehicle, when seen up close. 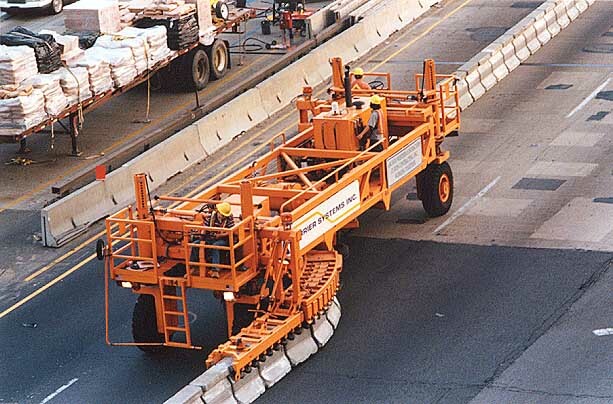 It takes a tremendous amount of power to move a heavy concrete median barrier, and to do it as quickly as this machine does it. It is fairly quiet when in operation, though. The motor is not loud, and the lowering of the barrier segments back down to the roadway provides a quiet 'plunk-plunk-plunk' sound that is not very noticeable even when you are standing under the bridge when the machine passes across the deck overhead. As you can see, each side of the bridge (actually two separate bridges that are about two feet apart) has been restricted to one lane each way as the temporary concrete median barrier is being shifted over. Construction workers, trucks, machinery and a large truck crane are already moving into place to begin work on another section of bridge deck replacement on the northbound side. The lighter-toned deck is the portion that has already been replaced.